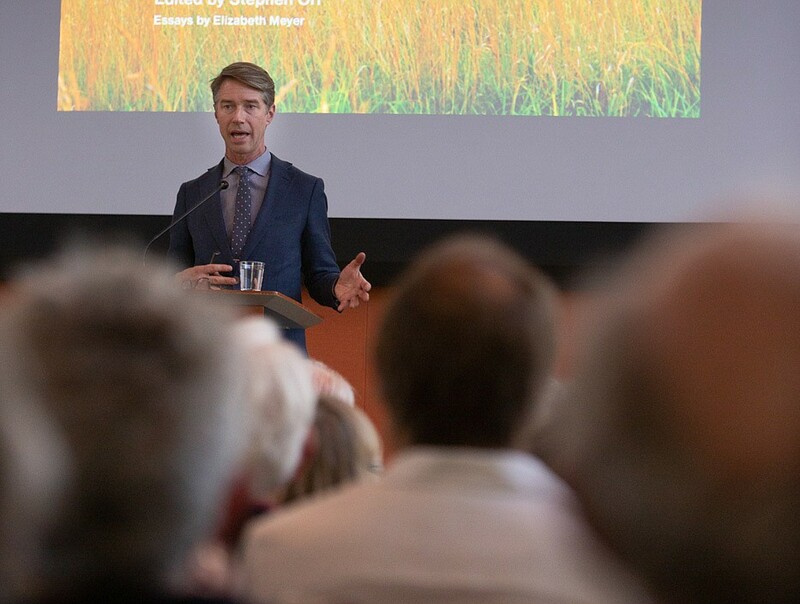 Thomas Woltz, one of America’s leading landscape architects, spoke at the Westmont College Global Leadership Center on March 12, offering hope and inspiration for community members still reeling from the devastating Thomas Fire and 1/9 Debris Flow. The Garden Club of Santa Barbara offered the free public event so that Woltz, with his thoughtful and creative approaches to resurrecting damaged land, might provide encouragement as the community finds its way forward. Woltz spoke of several damaged landscapes that he and his firm — Nelson Byrd Woltz Landscape Architects, based in Virginia — have restored to vitality and balance. Woltz and his team reestablished the area’s original rain forest ecology, planting more than 600,000 trees, and attracted wildlife back to the area, including the tuatara, a prehistoric reptile as old as the first dinosaurs. All of this was woven into a profitable working sheep and cattle farm and agricultural operation. Much of this land is sacred to the local Maori people, and that informed and inspired much of the landscape design. “By looking back, we found a way forward to establish a balance of culture and ecology,” Woltz said. Photo: (c)2019 Isaac Hernández HerreroSanta Barbara Garden Club presents Thomas L. Woltz presentation on Cultivating Hope in Damaged Landscapes. This park had devolved into a tropical landscape, ignoring the old native Florida flora. By showcasing natives, Woltz’s team hoped to encourage residents to introduce such plants into their own yards, abolishing the ubiquitous green lawns requiring so much water and so many chemicals. The response he wanted from visitors was, “I’d like that in my yard!” Woltz designed a children’s garden as part of the project, where they learn how they are “keystones” in nature and integral to its vitality. Event Co-Chair Carol Newman is a member of the Garden Club of Santa Barbara. Founded in 1926, the private nonprofit aims to stimulate the knowledge and love of gardening and to restore, improve, and protect the quality of the environment. For more information, visit gardenclubofsantabarbara.org.